Bill Leikam greets two gray foxes at the Palo Alto Baylands on March 10. Photo by Veronica Weber. In the early evening sunset of the Palo Alto Baylands, a pair of small, furry creatures peered from the brush, watching intently. With keen eyes and long, pointed snouts, the gray foxes remained well-hidden and silent. As the humans made their way along a trail, the foxes, curious, followed. They leapt swiftly among the broken trees and grass with an agility and grace that would make a cat look cloddish. Bill Leikam, aka The Fox Guy, rounded a bend. A gray fox, the size of a large house cat with an enormously long, bushy tail, stood stock still in the middle of the trail. About 12 inches tall at the shoulders with a grizzled-gray coat and red and white legs and undersides, the little fox raised her head slightly and sniffed the air. Leikam, a Palo Alto naturalist and director of the Independent Urban Gray Fox Research Project, waited. The fox walked slowly at first, then trotted toward the gray-bearded Leikam, stopping several feet away, sniffing again. Still keeping his distance, Leikam  a bush-hat-wearing, soft-spoken man  extended his hand to the fox, which he has named Tense, so it could identify him. Another little fox every bit as beautiful emerged hesitantly from the brush. Leikam immediately identified her as Tippy, so named for her habit of tilting her head from side to side while studying her environment, he said. Leikam has studied the baylands' gray foxes for six years. One of the oldest examples of canid, or dog family, the gray fox (Urocyon cinerareoargenteus) and the related subspecies Channel Island foxes (Urocyon littoralis) are the only living members of this genus, which dates back about 3.6 million years, contemporary with early small horses, the giant sloth and large-headed llama, according to scientific literature. They range from southern Canada to the northern edge of Columbia. 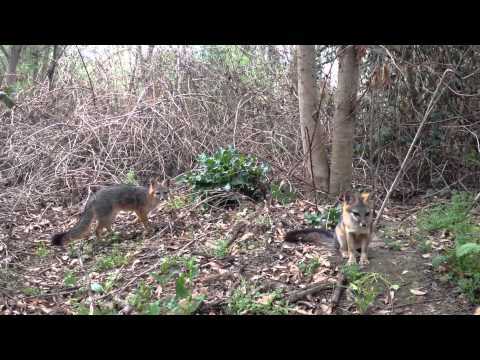 In the Bay Area, the foxes are a subspecies, Urocyon cinerareoargenteus californicus. They are known to inhabit the Diablo and Santa Cruz Mountain ranges. The area between San Francisquito and Adobe creeks is home to 26 of the creatures, Leikam said. They have been located south of San Jose between Los Gatos and Almaden to west of Interstate Highway 280 in the foothills above Stanford University, north near Bair Island in Redwood City, and up to the south side of the Oakland International Airport, according to mapping done by Leikam and wildlife conservation photographer Greg Kerekez. Leikam, a retired Cupertino English teacher, and Kerekez formed the Urban Wildlife Research Project to study and help protect some of the Bay Area's most elusive wildlife: burrowing owls in the South Bay and beavers in downtown San Jose. They are mapping the baylands' gray fox habitat with funding from the National Wildlife Federation. Ultimately, Leikam and Kerekez want to link all of the corridors to create a San Francisco Bay Area Wildlife Corridor stretching from Bair Island in Redwood City to Alameda Creek in the East Bay, Leikam said. Urban Wildlife Research is engaging in its first GPS collaring project to track 8-month-old baylands' foxes just before their first dispersal and discover their paths around the perimeter of San Francisco Bay. Leikam's journey with the foxes began more than 50 years ago. At 14, he saw his first fox. Growing up without much money, he and his brother set about trapping the foxes near Corralitos Creek in Watsonville to sell to a furrier. But the brothers soon soured on the idea of holding the wild creatures captive, he said. One look at the foxes' beguiling faces is enough to explain why Leikam has found these omnivorous creatures so attractive to study. They seem endlessly curious, are beautiful and exhibit an outstanding characteristic: They are the only canines that can climb a tree  straight up. "They are as agile as a squirrel  and they are wickedly fast when they want to be," he said. Fifty years after he gave up trapping, Leikam had a life-changing encounter with the gray fox while on a walk in the Palo Alto Baylands. "I came to a turn in the road and a gray fox was just sitting there. I went, 'whoa!' and I started taking pictures. I got closer and closer and closer, and that silly fox did not move. I got within 15 to 20 feet. Then it walked back into the bush. I went back each day, and I didn't see any foxes. On the third day three foxes came out of the brush. I started jotting notes," he said. Leikam shares a trait with the foxes. "All of my life curiosity has governed my life," he said. He sought advice from Ben Sacks, director of the Canid Diversity and Conservation Unit at the University of California, Davis Center for Veterinary Genetics. A pioneer of the native High Sierra and Sacramento Valley red foxes, Sacks encouraged Leikam to study the baylands gray fox, of which little is known, Leikam recalled. In the past six years, he has made some interesting discoveries, he said. Gray fox "helper" females may help raise a den of pups belonging to another female and male. Leikam documented two helper females who stayed behind to raise the little ones rather than going off to mate and bear their own offspring. And the idea of having a territory is not absolute by any means, he said. "It only really exists when the pups need protection and they need adults to bring food," he said. From April to July the foxes set territories while their young are most dependent. But from November through January, gray foxes maintain no territorial boundaries, he said. "It gives the young ones the ability to travel long distances in what would otherwise be closed territory to find mates and to find their own territory," Leikam said. Gray foxes also have another endearing quality. They engage in the "fox kiss." As a greeting, they will rub their muzzle under the chin and then touch noses, he said. As April approaches, the gray foxes get ready to give birth after a 53-day gestation. They will birth in a natal den above ground in a dense thicket, to which they return year after year. One den in Palo Alto has been used for more than 20 years, Leikam said. The average litter contains three to four pups. Occasionally they have as few as one and as many as seven, he said. When born, the pups are 8-inch gray or black balls of fur. The parents will move to a different den every 15 days to protect against predators, he said. While a mother and father care for the young, "family" is a misleading term in the biological sense, Leikam said. "We think of a traditional family as mom, dad and the kids. But a female might be impregnated by two or three males. In North Carolina, research found that 9 percent of all 'families' are genetically different from the male who takes care of them," he said. One suspicion is that the mating diversity allows the female to find a male that is a good hunter. When she gives birth, he is the one who brings the food to the den. Baylands' gray foxes have few predators to fear, he said, unlike their mountain and forest brothers and sisters, which could be prey for coyotes and bobcats. The baylands' foxes are at the top of the food chain. They might be pursued by an occasional red fox, which is a non-native species introduced by man to the area. The marshes provide a wide and rich variety of foods, including rodents, birds, insects and berries. The bulk of the gray foxes' hunting, nearly 80 percent, is done at night, he said. Gray foxes come out at dusk or night, but they are sometimes seen in the daytime if the night hunt has been dismal, he said. During the early part of the year, 90 percent of their diet is protein-based, and they will clean a carcass completely, just as would a turkey vulture, he said. "They will take care of a rodent population and can keep it under control. They eat ducks and snakes. Only jackrabbits can outrun a fox. It has to be wily enough to ambush a jackrabbit," he said. Leikam was surprised when a male he captured on video brought in a full-sized Canada goose. "He had to drag that thing in, and he was panting," Leikam said. Leikam trudged through the underbrush on a recent evening to set up his motion-sensitive night cameras. Ever-curious Tippy and Tense followed him at a discreet distance, wending over downed trees and underneath shrubs. "I call them the 'bush dogs,'" he said, for their habit of hugging the edges of forests and the brush line. At a small clearing criss-crossed by foot-wide paths, the foxes intensely sniffed logs and broken branches, which were apparently marked with the scents of passing creatures. This spot is a wildlife corridor used by a number of four-footed animals, including raccoons, skunks and the gray foxes, he said. A third, cautious fox that Leikam calls Dark Eyes appeared at the edge of the clearing, leaping silently and gracefully over felled trees and watching the proceedings from a distance. Leikam recounted some of the revelations caught by his trail cameras. "I've gotten some of the most spectacular video: mom and dad teaching fighting techniques; they toss things they find back and forth to each other; learning to climb trees  they learn how to fall out of a tree. And I caught the young ones playing with a toy  a slender branch hanging off a bush. They grabbed ahold of it and pulled it back. When there was enough tension, they would let go and it popped up," he said. With the impending births of new litters in the coming weeks, he will have fresh opportunities to delve into the wonders of foxes. A gray fox needs 1 to 1.5 square miles of territory to feed its young. A male will travel 10 to 12 miles in search of a mate, and a female will travel 6 to 8 miles, he said. The Palo Alto Baylands' foxes are crowded into a 1.5-mile area. "Given the nature of the area, that's a lot of foxes," Leikam said. The foxes' corridor is fragmented around the bay. On the Peninsula, the habitat is fragmented through the Facebook campus in Menlo Park and Google in Mountain View, he said. Where they can, the foxes make due with navigating impediments. "You can see where they jump up over concrete barriers with muddy footprints," he said. The fractured habitat could affect the urban gray foxes' future. "I suspect there are pockets of foxes that can't get out and are inbreeding. We've seen floppy ears. They can't hear like a normal fox, and that puts them at risk," he said. Urban Wildlife Research hopes to get permission from companies and landowners to make changes in the environment so the foxes can freely roam throughout the Bay Area corridor, he said. But getting that buy-in requires educating the public. Leikam often gives a multimedia presentation, "A Year with the Urban Gray Fox," to schools, small groups and corporations. Recently, workers at a technology center along East Bayshore Road encountered the creatures and called Leikam in for advice. The foxes were sleeping on car hoods in the parking lot, attracted by the engine heat, he said. The foxes do not pose a threat to humans, although there are many misconceptions about them, he said. It is rare for gray foxes to carry rabies, according to the Humane Society of the United States and the U.S. Department of Agriculture Forest Service. And they may be beneficial in reducing Lyme disease because they consume host mammals, according to a July 3, 2012, study published in the Proceedings of the National Academy of Sciences. Most gray foxes are elusive; Tippy and Tense are unusual. They haven't dispersed in search of mates and they seem to prefer hanging out near each other, Leikam said. From under the brush, they have observed Leikam observing the foxes and dutifully setting up his cameras each evening for the whole of their lives. As Leikam finished setting up for the night, Tense and Tippy ducked under the brush. Having satisfied their curiosity, they departed, ostensibly in search of their evening meal. So far, the drought does not appear to have affected the baylands' gray foxes, but a heavy winter storm did, Leikam said. When floodwater wiped out their dens and their trails to return, one group of foxes was missing for a week. Tippy was not among them. Leikam figured she was washed out into the marsh. But a month later, she returned, battered. She has since healed. Loss is something Leikam has had to get used to in his pursuit of wildlife, he said. Come November, the foxes will have dispersed. The little creatures will head for new territory in search of food and mates, and only their parents will come back, he said. "One thing you have to get used to is that you can become so attached to them. You have to learn to let go," he said. Scientific name: Urocyon cinerareoargenteus; 15 accepted subspecies, seven of which are in North America. Bay Area gray fox subspecies is californicus. This guy is doing a huge disservice to these fox. They should be fearing humans rather than walking right up to him. Over exposure or feeding are my best guesses to why. Stop over loving the wildlife and keep them wild. Shame on you for publishing this article. It is a disservice to the foxes. Over the last few months I have seen a lot of foxes down at the Baylands just after dark. One surprised me later at night by following me along a path for 40 or 50 yards, maybe 10 to 15 feet away. I stopped to let it go past or get away but it stopped as well and looked at me. Eventually it ran off. Recently I saw one in the mid afternoon on the western end of Bixbee. However this one was sort of yellow, more like the coloration of a labrador, I am not sure what kind of fox it was. I thought the mantra of dealing with wildlife is "leave them alone, stay away". This guy is some kind of fox expert which I am not but his behavior is the opposite to what I have believed to be recommended. Either way it is wonderful to see them running around down there. Susan and David -- please read the whole article, and recognize that if people like Bill Leikam and the reporter don't do what they've done, few will even know this wildlife exists when their habitat is destroyed and they are long gone. "The fractured habitat could affect the urban gray foxes' future... Urban Wildlife Research hopes to get permission from companies and landowners to make changes in the environment so the foxes can freely roam throughout the Bay Area corridor, he said....But getting that buy-in requires educating the public. Leikam often gives a multimedia presentation, 'A Year with the Urban Gray Fox,' to schools, small groups and corporations. Recently, workers at a technology center along East Bayshore Road encountered the creatures and called Leikam in for advice. The foxes were sleeping on car hoods in the parking lot, attracted by the engine heat, he said." Urban development, including actions taken by Palo Alto voters and the City Council, will adversely impact wildlife far more than a few cameras in their environment, and if no one knows they're there, they will have no sense of the adverse ecological impact of development. I saw one a few years ago at the Baylands baseball field. I had no idea foxes were native to the area. Magical. What a wonderfully informative article! Bill Leikam, the Fox Guy, is doing a great service educating everyone with his study of the Baylands fox. They are common on the Palo Alto Muni Golf Course, such beautiful animals! If The Fox Guy were feeding the foxes, or restraining them, or interfering in some way with their wild life, then I'd agree with the nay-sayers here. But being out among them, and having them recognize you as non-hostile, is harmless. Foxes are smart, and aren't likely to confuse any other person with this person, or to become less wary of everything that moves just because they've met one kind human. Mr. Leikam and The Weekly perform a critical service by learning as much as possible about the species, and sharing what's been learned. In this way, we can all make better-informed choices about how and why to protect our ever-dwindling wild spaces. I was fascinated by this article. I learned a lot. I didn't know about the foxes, I respect wild animals and found them interesting and "cute" and wonder if any artists who go out to the Baylands have painted them?? Would be fun to buy (hint to local retailers). We have taken lots of photos out there but don't have any of the foxes! I also continue to hope the City of Palo Alto will do the right thing to preserve the PA Baylands in a way to encourage wildlife, and for the public to enjoy. I hope the boardwalk over to the bay can be replaced soon. Some years ago, a very credible neighbor out on a foggy morning (daylight) walk saw a reddish fox at Cubberley field. Animal Services officer said this is not unusual and that the fox likely got disoriented in the fog. It was not acting unusual and was not seen there for very long. I've seen 4 of these little furry guys/gals in the last few months at my shop. they seem to have no fear of humans at all. Good looking animals. I've never seen them until this year though. Humans, this is why you can't have anything nice. DESTROY, CONSUME, MULTIPLY. I live in the East Bay and used to run in Joaquin Miller Park in Oakland. I felt truly "gifted"any time I was lucky enough to see early morning wildlife, including sitings of Grey Fox. I haven't seen them in many years, but hopefully they will show up again as the population grows and survives. Reminder: we have to share our water with wildlife as well as our dogs, cats and horses. Injecting toxic chemicals into our ground water threatens us all. Now I know where all the salt marsh mice and ridgeway (sf bay) rails are going. Maybe a lion or two in the baylands could balance this future over population problem out. If not, the Feds will move in to Don Edwards and start their furbearing dispatchment night program to cull the population. No worries though. It's done at night when the refuge is closed to the public. They did a wonderful job with the red foxes and created a great opportunity for the gray ones. Thank you for reading the article about my study of the gray foxes; something that has never before been done in such a comprehensive manner. I am adding to our knowledge of these mammals and taking that into schools, into corporations, into organizations where people are coming to understand something about these otherwise elusive animals. Across the country and in other places around the world, more and more wildlife is moving into our towns and cities. The most famous of all is probably raccoons and the coyote, but they are by far not alone. Many other animals are there as well. Locally, the foxes that you sometimes encounter are the urban gray fox. They have a particular characteristic about them that shows very early in their lives, namely that they have little fear of human beings. This is most likely due to a meme; behavior passed on from generation to generation by the adult gray foxes. (I must point out that they are still wild animals in that if you were to try to touch one, it would dash off and away from you. No matter how close they come, that flight response remains.) The urban gray fox is in contrast to the gray foxes that live along creeks in the Santa Cruz Mountains where they seldom if ever, encounter a human. If they hear you coming, they are off into the brush long before you know they are there. So with that contrast in mind, along with the behavior of the urban gray fox, it becomes understandable as to why the foxes come from the brush when I am monitoring and documenting their behaviors. I could add much, much more, but I'll end here. They are among us (or vice versa). So, it is very important that we learn about them. This town never fails to amaze me. A detailed article about someone who has taken real effort. But the first two comments are negative. Who are these people? "Who are these people?" you asked. Just people with an alternative opinion. I stand by my earlier post. The 'Fox Guy' is humanizing these grey foxes. They are no longer wild. Yes, you have reached out to the press and got them to write an article about the cute furry creatures, but you have essentially had too much human impression on them that they are no longer truly wild. You wrote, "...you have essentially had too much human impression on them that they are no longer truly wild." What would you have me do? How can I accomplish my scientific goals of understanding the behavior of these foxes and then sharing their unique behavior without getting "close?" Is the value of understanding them of lesser value than they being wild? Would we have ever learned the nature of chimpanzees had not Jane Goodall been able to get close to her band of chimps and documented their behavior? These urban gray foxes are born into an environment of people, of human things that dictate that they are habituated at least to some extent. Living on the fringes of our civilized world makes it essential for them to "understand" us, to know that dumpsters contain food, that a car can injure but it is also a good place to sleep during the day because it is warm. By the very fact that they live in such an environment, I don't see any way that they can be, as you say, "...truly wild." This is an excellent article, helping inform the public on how a dedicated and patient naturalist collects data on wildlife. The bay corridor idea is a good one. Thank you for running this story. Spotted one yesterday on the Guadalupe River Trail right by SJC. Very cool! Was having my car serviced yesterday at Honda off of Embarcadero near the golf course and there was a fox walking through the car lot. It was a nice site to see except he wasn't in his natural habitat. I hope he was able to get back safely to the Baylands.